If you already know a little about genetics then you'll probably be familiar with the following terms. Most of them crop up in the basic genetics taught at school, but just to make sure, we'll go through all the relevant ones anyway and have a look at how they are applicable to dogs. Genes control just about everything about a living creature. They control how the creature grows and develops, how it functions and how it looks too. On this site we're focusing on just one aspect of looks - colour. A gene is basically a set of instructions, contained within an animal's DNA, which tells the cell how to produce a particular protein (in our case, pigment). The genetic make-up of a creature is described as its genotype. Different variants of genes are known as alleles. Alleles come in pairs - one from each parent. When we write about alleles we use letters to denote them, for example a and b. Genes are all tied together into a long strand of DNA. Each point on this strand of DNA is called a locus (locii is the plural). At each locus there are two alleles forming the gene. The alleles present at each locus are picked from a list of possible alleles, which is called a series. There may be any number of alleles in a series, but it's usually 2-5. Each locus has its own series, and the alleles in that series can only occur at that locus. For example, in the E series in dogs there are five alleles - E, Eg, Eh, Em, and e. Each dog has a combination of two of those alleles from the E series on its E locus. It might have one copy of e and one of E, or maybe two copies of Em. See the "Summary of series" page for a list of all the series. On this site, I will be using the terms "series" and "locus" pretty much interchangeably. While a genotype is the genetic makeup of an organism (a technical list of locii, genes and alleles), phenotype describes the effect of the genotype on the look of the organism. If we talk about a black dog with white markings then we are talking about its phenotype. There may be more than one selection of genes that could cause this phenotype. If we talk about a KkSii dog then we are talking about its genotype, which is much more specific. Not every colour gene in the dog's genotype will necessarily affect it's phenotype. Although every dog carries two alleles at each locus, only one of these alleles is generally expressed (meaning only one will actually be used, and the other will just effectively lie dormant). Which of the alleles is expressed depends on dominance. The most dominant allele will always be the one which is expressed in the phenotype. A recessive allele is one which is less dominant. Dominant alleles are generally written with a capital letter, for example B. Recessive alleles are written with a lower case letter, for example b. Sometimes there is more than one dominant or recessive allele on a locus. When this happens, there is usually an order of dominance, so one of the dominant alleles is more dominant than the other, and one of the recessive alleles is more recessive than the other. We generally talk of series having "top dominants" and "bottom recessives". A dog with the BB genotype has two dominant alleles, and so it will only express B. 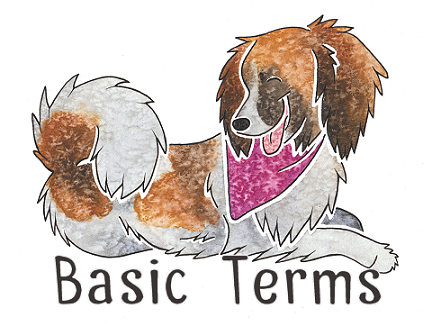 A Bb dog will also express B because B is dominant over b. bb is the only genotype where the dog will express b. It's also worth noting that sometimes both of the alleles on a locus will be expressed. This is called incomplete dominance (or co-dominance in some cases), and only happens on particular locii. The resulting dog will have a mixture of the two alleles, but its markings will generally lean more towards the more dominant allele. For example, the S series controls white markings, and the alleles in it display incomplete dominance over one another. sp is the allele for piebald (white markings covering 50% or more of the body), and S is the allele for no white markings. A spsp dog will be piebald, but even though S is slightly more dominant than sp, an Ssp dog won't necessarily just be solid-coloured (as you would expect if a dog can only express its more dominant allele). Instead it may have some minimal white markings, because it is able to partly express it's more recessive allele (piebald). Incomplete dominance and co-dominance are more-or-less the norm for most genes, however many of the dog colour genes do happen to have a simple dominant/recessive relationship. It may be useful here to explain how dominance actually works, for those with a further interest in genetics. This bit is not entirely necessary, so feel free to skip it. Genes code for proteins (they basically tell the cells how to produce them), so the different alleles code for variants of the proteins. These variants arise through mutations in the genetic code. Mutations can be good, bad or neutral. A "bad" mutation is one that changes the genetic code to the extent that the protein can no longer be made properly by the cell. If we take the dilution gene as an example, D is the allele that codes for a normal pigment. d is a "defective" gene that stops the cell from being able to produce pigment of the usual strength. Now, when a dog has the genotype Dd it has one allele that codes for normal pigment and one allele that codes for defective pigment. The allele it has that codes for the correct pigment is enough for the cells to still be able to produce it, because it still has the information that it needs, so the dog will have the normal colour (i.e. black). This is what causes D to be classed as dominant. However, if the dog is dd then the cell does not have the information it needs to code for the correct pigment, so it is forced to use the "defective" allele, causing the dog to have the abnormal colour (i.e. blue). Note that a "defective" allele is not necessarily a bad thing - as the blue gene only affects the production of melanin in the coat, it has no negative effects on a dog's health or conformation other than changing its colour from black to grey. By their very nature, recessive alleles are generally "defective", causing either abnormal production of a protein or no production of the protein at all. This is why recessive alleles are sometimes associated with genetic diseases such as sickle-cell anaemia, where the defective allele affects the shape of red blood cells and so their ability to do their job correctly. A person with just one copy of the sickle-cell allele will not be affected to the same extent because their normal allele means they produce enough normal blood cells to stop the abnormal ones from being an issue. Technically both of their alleles are being expressed, as in they are producing both normal and abnormal blood cells, but the overall effect is more-or-less the same as if the person had two normal alleles, so the normal allele is therefore classed as dominant. Hopefully this example makes it clear that dominance and ressiveness are not mysterious properties of alleles - just terms used to describe the effect of combinations of alleles on the phenotype or functioning of the organism. Incomplete dominance, therefore, occurs when a copy of the normal allele is not enough to make sure the cell is able to code for the protein correctly. This happens in the sickle-cell anaemia example above, but the effect on the person is minimal. With colour genes, incomplete dominance can result in a combination of the two alleles at the phenotypal level (for example, it may produce a paler colour than the normal allele). A heterozygous pair of genes is one where the two genes are different. A homozygous pair of genes is one where the two genes are the same. We generally talk of a dog being, for example, "homozygous for merle" (two copies of the merle gene, M) or "heterozygous for merle" (one copy of the merle gene). bB, Dd, Ayat, and Ssi are all examples of heterozygous pairs of genes. bb, DD, AyAy, and spsp are all examples of homozygous pairs of genes.